Don't want to spend money on Photoshop? Maybe you don't have to. Splashup.com allows you to create and edit graphics online. 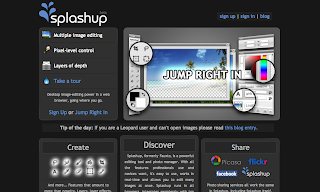 If you're familiar with Photoshop, you'll find the Splashup interface, tools and menu items familiar. Bloggers wanting to create graphic banners, headers, sidebar graphics, etc. will find the text editing features particularly useful. Splashup also allows you to play around with logos and other images. I was able to create a 125x125 .jpg banner and save it to my desktop pretty easily after a couple of false starts. If you're not accustomed to Photoshop's tools, you might want to hold off on trying Splashup until it's out of beta. The tutorials and customer support are obviously still in development. If you try Splashup, let me know how you like it.